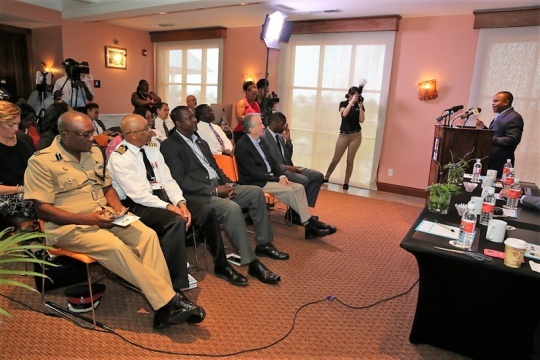 FREEPORT, Grand Bahama – The Bahamas Blockchain and Cryptocurrency Conference was officially announced by Minister of State for Grand Bahama in the Office of the Prime Minister, Senator the Hon. J. Kwasi Thompson during a press conference at Pelican Bay on Thursday, May 24, 2018. The conference, scheduled to be held June 20 to 22 at the Grand Lucayan, was described by Minister Thompson as, “our coming out party” for Blockchain and FinTech. It is anticipated that representatives from 500 companies will converge on Grand Bahama, where investors and entrepreneurs will meet. Stating that Grand Bahama is suited to be the technology hub of the region, the Minister added that the first technology summit held in November hosted some of the finest minds. “The Technology Summit was instrumental in beginning the strategic process of building a technology sector in The Bahamas. The government has since begun implementing recommendations of the Steering Committee to make this technology hub a reality. And I want to particularly thank Dr. Donovan Moxey who heads the GB Tech Hub Steering Committee. Announcing plans for the upcoming conference, the Minister said, “I’m pleased to announce the Bahamas Blockchain and Cryptocurrency Conference, BBCC for short, which is designed to attract investors, entrepreneurs and service providers and tech companies from all over the world who are focused on making investments, starting and developing companies and building business relationships with blockchain technology. Some of the topics to be discussed will be: The Technology Sector of The Bahamas is Open for Business; Why Should We Invest in The Bahamas; A Global Perspective on Regulatory Framework for CryptoCurrency and ICOs; and What Does the Future Look Like for Blockchain, CrytoCurrency and FinTech Solutions. Featured will be “high powered” speakers, even one or two of Forbes’s CryptoCurrency Billionaires list. Sponsors of the event include Aliv, the Grand Bahama Port Authority, BTC, Cable Bahamas, Grand Bahama Power Company, and GIBC. It is highly anticipated that the hosting of the conference will have an immediate impact on the local economy with the filling of hotel rooms, use of taxis, restaurants, tours and everything else the island has to offer. Minister Thompson noted that it is important that the island show the visitors why Grand Bahama is the right place to invest. He encouraged Bahamian business persons and aspiring entrepreneurs to be a part of the conference.